Innovative design and accurate tracking technology deliver a comfortable mouse experience for the mobile lifestyle. Stylish and eye-catching, the Arc Touch Mouse delivers reliable wireless freedom for precise clicking on the go. It works on a rough wood surface or carpet thanks to BlueTrack Technology. Plus, it gives you wireless control of your computer up to 15 feet away. 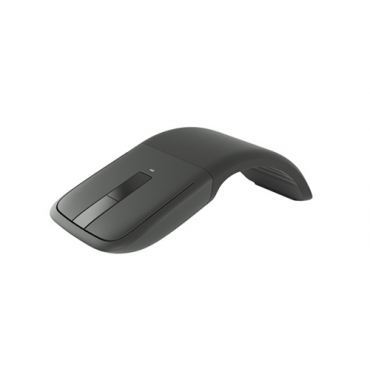 Designed for quick use and seamless storage, the Arc Touch Mouse curves up comfortably below your hand for an effortless mousing experience almost anywhere. And when you’re done, it flattens to turn off and slips into your pocket or bag, just like a cellphone. The Touch strip on the Arc Touch Mouse responds precisely to the speed of your finger movement, using Haptic feedback, light vibration that signals scrolling speed, to scan through documents and web pages as quickly or slowly as you need—all entirely by feel.